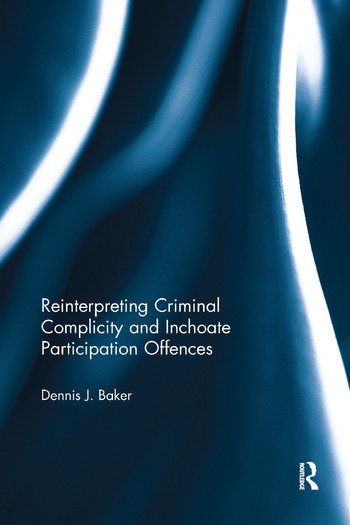 In Reinterpreting Criminal Complicity and Inchoate Participation Offences, Dennis J. Baker argues that the mental element in complicity is one of intention, that recklessness alone is not sufficient. This is demonstrated by showing that the ancient and modern authorities on complicity required intention. The book argues the ‘causal participation’ element in complicity means that the conduct element can only be established when there is intentional encouragement on the part of the accessory. As the Accessories and Abettors Act 1861, like most of the statutory provisions found in the United States, deems that both perpetrator and accessory are perpetrators for the purpose of punishment and crime labelling, limiting the mental element in complicity to intentional participation is, the author argues, the only way to reconcile these provisions with the requirements of proportionate punishment and fair labelling. As some forms of reckless encouragement and assistance will not be criminalised if the mental element in complicity is intention only, the author suggests that the solution is to amend section 45 of the Serious Crime Act 2007 to criminalise reckless participation. In addition, the author argues that standard complicity and joint enterprise complicity have the same mental and conduct elements and thus joint enterprise complicity is not a distinct form of complicity. Dennis J Baker is Professor of English Law and Head of the School of Law at the University of Surrey, UK. "I had a copy of the manuscript of this book when examining the issues raised in R v Jogee  UKSC 8, and it was helpful to me. Professor Baker’s arguments on the point, which was of central importance in that case, that foresight is evidence from which intention may be inferred, but no more than evidence, and that secondary liability for a criminal offence requires intent to encourage or assist its perpetration, were well researched and cogent. The same applies to his writing about the need for there to be actual assistance or encouragement, and about the nature of intent, which may be conditional. All in all, Professor Baker’s book is a valuable contribution to the understanding of an important and sometimes confusing part of the criminal law."